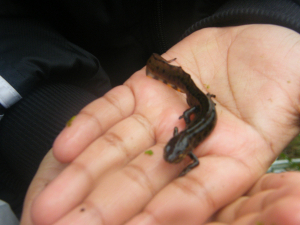 Observation - Calthorpe Project Newt - UK and Ireland. Description: There's a dense population of smooth newts in this pond in the Calthorpe Project Wild Garden- on this day counted 9 visible. The pond is only 3m by 1.5m, but has a lot of frogspawn. There's a dense population of smooth newts in this pond in the Calthorpe Project Wild Garden- on this day counted 9 visible. The pond is only 3m by 1.5m, but has a lot of frogspawn.